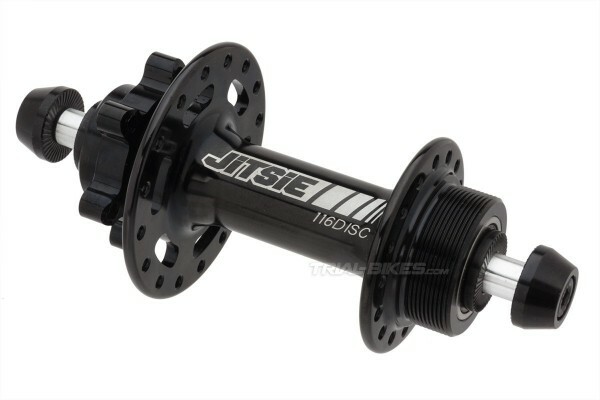 - New rear hub for disc brakes by Belgian brand Jitsie, specialized in Moto and Bike trials components. - Tested and developed by the Jitsie Team riders Dani Comas, Rick Koekoek, Vincent Hermance, etc. - Its simple, minimalistic design allows for weight and costs saving, while keeping a high strength. - Both the hub shell and axle are CNC mechanized from a single piece of high quality aluminium alloy. 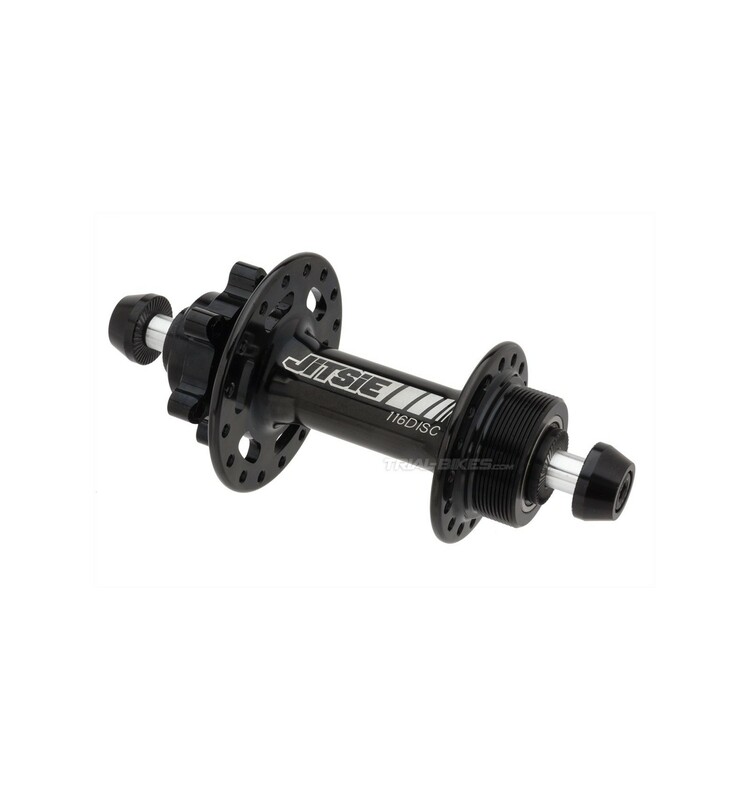 - 116mm spacing, suitable for most 20" bikes, as well as some new 24" and 26" bikes which use this spacing (in example, the Koxx Sky 2 26" bike)..
- Please note: this hub is supplied with a 5mm spacer for the non-drive side, which can be replaced by a 2mm one (not supplied) in case you want to run a Jitsie disc protector. 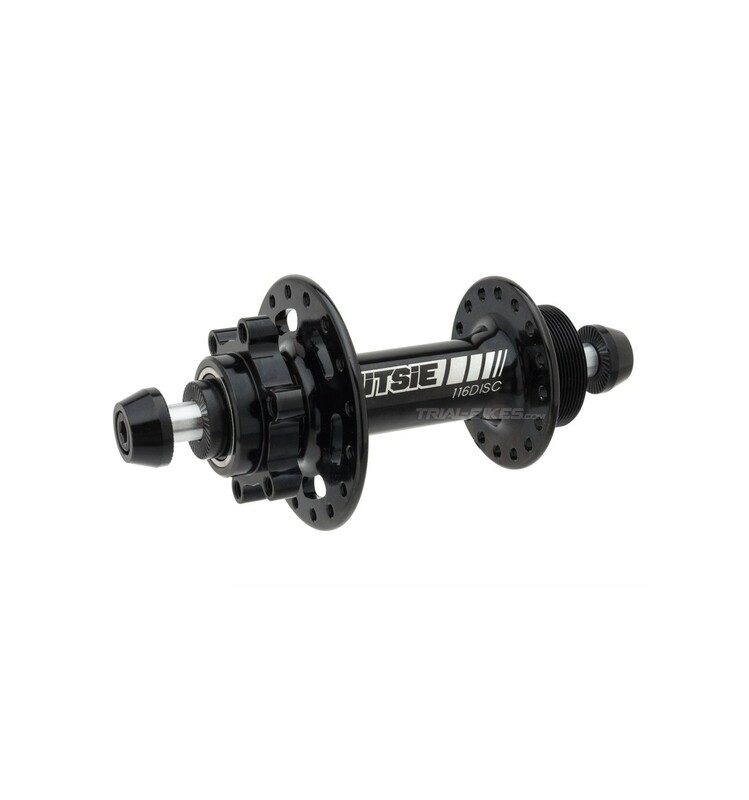 - The axle has a 10mm diameter and M6 thread, and is made from high quality 7075-T6 aluminium alloy. - Standard 1,37 "x 24 tpi thread allows the use of screw-on freewheels and sprockets. - M6x25mm bolts and serrated washers included. - Anodized gloss black finish, with white laser etched JITSIE 116DISC graphics. This hub is only suitable for 32H rims. If you have any doubts, please contact us!